After outclassing Queensland Metro in the semi-finals by 6-2, Solomon Islands was faced with an insurmountable challenge with NSW Thunder. However, hopes that the team could make history emerged at the halftime break when they took the breather 2-1 in front. The second half was a tougher affair than the first but the youngsters held their calm to not only defend their lead but extend it to 3-1 for a slightly more comfortable victory. President of the Solomon Islands Sports Coalition (SISC), the organisation responsible for sending the youth teams to the competition, Nacanieli Seru, says that it is a proud moment for Solomon Islands. “Futsal is a sport that always makes the nation proud and we are proud of the boys,” Seru says. Seru added that the success of the team is highlights the value of the junior leagues run by SISC under the SALT programme in Honiara and other provinces. The players in the Under-12 team were selected from the Honiara futsal league run on grass at the Lawson Tama stadium. The SISC has indicated that the junior futsal leagues for this year will commence early in the year. 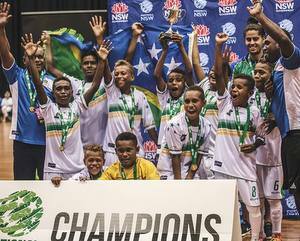 The Solomon Islands U-14 futsal team also took part in the Australian futsal nationals but did not share the success of their younger countrymen, after failing to make the finals. SIFF supported the participation of the two teams with assistance towards travel.